Nowhere in Australia will you get the extreme diversity of National Parks than along the Murray River. The Murray River Guardian aims to provide campers with a 'one-stop-shop' on safe and sustainable camping as well as highlight key environmental projects and tourism information from Corowa to Mildura. The paper is hand delivered by Rangers on patrol, and is also available from local visitor information centres, petrol stations, bait shops etc, and across the borders in New South Wales, Victoria and South Australia. 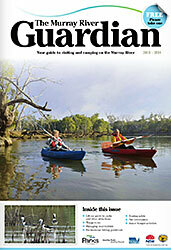 The Murray River Guardian is available online as a digital in flip book for you to enjoy and appreciate visiting and camping on the Murray River in Victoria and New South Wales. Follow the Discover Murray River Trail starting at the source near Australia’s highest peak, Mt Kosciuszko heading west towards the world’s largest River Red Gum forests at Barmah near Echuca and towards the semi-arid landscape of Mildura, Balranald and Wentworth you’ll discover the World Heritage Willandra Lakes and Mungo National Park and Murray Sunset National Park. As you head into South Australia you’ll discover the biosphere of the Riverland and the Murray River National Park before making your way south to the Coorong National Park. You’ll also encounter a myriad of reserves, state and conservation parks and billabongs. From snow to desert to ocean, the Murray River has spectacular serenity and beauty. We’re proud just to be sharing it with you. Enjoy and please remember to protect our river environment and National Park care. Separate to the National Parks, however highly aligned, is the Living Murray initiative that focuses on improving the environment at six 'icon sites' along the Murray River. The Living Murray icon sites were chosen for their high ecological value - most are listed as internationally significant wetlands under the Ramsar Convention - also for their cultural significance to Indigenous people and the broader community.